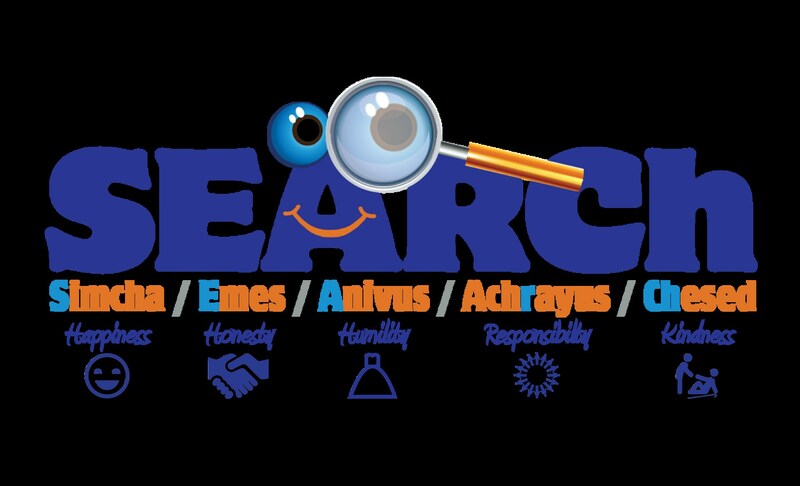 SEARCH- which stands for Simcha (happiness) Emes (honesty), Anivus (humility), achRayus (responsibility) and Chesed (Kindness) is TDSP’s signature Middos (moral character development) program. The program was developed by TDSP staff, and the impetus for it came about as an extension of our mission to not only teach Torah, but to guide children to refine their characters. The program includes monthly assemblies and weekly Middos goals. Middos are encouraged through songs, games, role-plays, and discussion. The Middos in the program are Simcha, Emes, Anivus, achRayus and Chesed. Taking the first letter of these five words creates the word SEARCh. Every Jew is required to search greatness at all times. Our program is called SEARCh to remind us that we are constantly SEARChing to attain greatness. The school will be working on many aspects and nuances of these middos. We have provided below a loose description of each Middah. Simcha is loosely translated as happiness. We are encouraged to navigate with happiness in all areas of life, even when things don’t go our way. Being happy with what we have and believing in Hashem throughout the process of life fall into this category. Emes is truth and honesty. Always being honest and showing integrity is expected of us at all times. Being honest to friends, family and to ourselves is a component of Emes. Anivus is commonly understood as humility. One should not be conceited; rather a person should understand that talents are given by Hashem. Good sportsmanship and honoring (Kavod) others are integral components of Anivus. achRayus is responsibility. Taking responsibility for all of our actions, words, and possessions are all part of achrayus. Chesed is known as Kindness. Kindness embodies a person who seeks to show compassion, sympathy, and care to everyone always. The famous dictum of “do unto others as you want done unto you” would fit in this definition.